Review of implementation of the Protocol on Strategic Environmental Assessment (2010-2012). Electronic-only publication, available in English, French and Russian. 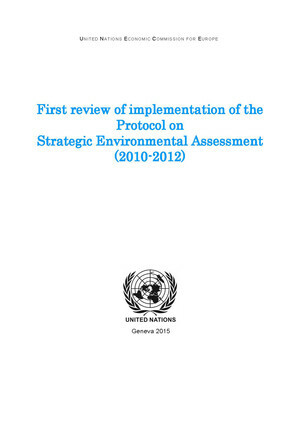 At its second session, in 2014, the Meeting of the Parties to the Convention on Environmental Impact Assessment in a Transboundary Context serving as a Meeting of the Parties to the Protocol on Strategic Environmental Assessment, welcomed the reports by the Parties to the Protocol on their implementation, and adopted the First Review of Implementation, as presented in this publication. It also noted its findings (presented in section 1.B of the Review) and agreed again to repeat the review of implementation exercise for the third session of the Meeting of the Parties. The Meeting of the Parties requested the Implementation Committee under the Convention and the Protocol to take into account in its work general and specific compliance issues identified in this First Review of Implementation. The Committee is responsible for the review of compliance by Parties with their obligations under the Convention. However, besides its importance to the Implementation Committee, this Review provides valuable information for Parties wishing to strengthen their implementation of the Convention, for States considering acceding to the Convention in their legal and administrative preparations, and for others wishing to understand better how the Convention is implemented in national legislation and applied in practice.